His Importance as a Philosopher. Physician and philosopher of note; born at Bokhara in 980; died in 1037. His works, which were brought to Spain about one hundred years after their publication, exerted a great influence upon Jewish thought in the Middle Ages. His philosophical investigations are embodied in a great encyclopedic work entitled "Al-Shafa'" (Healing), a term which in the Latin translation has been corrupted into "Sufficentia." This Latin translation, prepared by the aid of Jewish interpreters, has been frequently used by Jewish authors, notably Samuel ibn Tibbon in his "Yiḳḳawu ha-Mayyim." It is divided into four parts; namely, logic, physics, mathematics, and metaphysics. In addition to the "Shafa'," there is a smaller encyclopedia, "AI-Najah," which, under the title "Healing of the Soul," was, in 1330, translated by Todros Todrosi in Rome. In regard to Avicenna's importance as a philosopher, Maimonides and Shem-Ṭob Falaquera have both expressed their views. Maimonides says: "The works of Avicenna, although distinguished by tolerable accuracy as well as by subtlety of speculation, are nevertheless inferior to those of Abu-Nasr al-Farabi; they are useful, however, and deserve to be studied." This opinion is shared by Shem-Ṭob Falaquera, who declares that Avicenna's works are "exact, but incomprehensible to those unfamiliar with logic." Of greater importance are the medical works of Avicenna, and as an author he has been distinguished in this domain by the honorary title of "Prince of Physicians." His chief medical publication is the "Canon," a complete system of medicine, which, in 1279, was translated into Hebrew by Nathan ha-Meati ("of Cento"). Parts of the work were translated also by two other Jewish scholars, and numerous commentaries have from time to time been written upon it. In addition to this work, Avicenna has left a smaller medical compendium-in ten volumes, and has even given expression to his medical knowledge in rime. The last-mentioned publications were likewise perpetuated in Hebrew translations. The "Canon" ("Al-Kanun fial-Tibb") the greatest literary production of Avicenna, is a colossal work,which for five centuries was accepted as a guide in European universities, and which was used as a textbook in the universities of Louvain and Montpellier until about 1650. It consists of five books, subdivided into funûn or fen (sections), tractatus, summa, and caput. Of these volumes the first and second treat of physiology, pathology, and hygiene; the third and fourth, of the methods of treating disease; and the fifth, of materia medica. The many points of excellence possessed by the voluminous work and its admirable literary style make it possible to understand readily the reason for its great popularity both in the Oriental schools and among the Occidental Arabists of a later date. It was among the latter, rather than in Arabian Spain—where the influence of Averroes was predominant—that Avicenna's works attained their greatest popularity. In some respects the "Canon" of Avicenna is not unlike the works of his predecessors Rhazes and Ali, although excelling the "El-Ḥawi" (Continens), or "Summary," of the former by greater exactness of method. This power of systematization was due perhaps to his mastery of logic—a domain in which his acquirements entitled him to be ranked as one of the principal forerunners of Albertus Magnus and his immediate successors, all of whom were compelled to draw their formulas largely from Avicenna's works. The logic of Avicenna is distinguished by great comprehensiveness of scope, and by a scrupulously conscientious endeavor on the part of the author—who here evidently follows the example of Al-Farabi—to present the subject clearly, comprehensively, and circumstantially. As regards the fundamental tenets of his philosophy, Avicenna taught that matter, the principle of individuation, does not directly emanate from the Godhead, although it is in its primal origin eternal, and includes within itself all possibilities of development. In other words, he held that while all things are primarily traceable to the agency of an immutable Deity, they can not owe their existence to the immediate influence of such a Deity, inasmuch as the immutable can not itself create substances subject to the element of change. The first and only immediate product of God, therefore, is the worldsoul or world-intelligence, which unwinds an endless chain of creation throughout all the celestial spheres down to the earth. The cause that produces, however, must also conserve, for cause and effect are identical; from which it follows that the world itself, like God, must be eternal. Avicenna's psychological views, expressed in the sixth volume of his work on physics (the second part of the "Shefa'," in the so-called "Liber Sextus Naturalium"), exerted great influence upon Jewish scholars. In his preface to this book the Latin translator, Johannes Hispalensis, declares that it contains "Quidquid Aristoteles dixit in libro suo de anima et de sensu et sensato et de intellectu et intellecto." 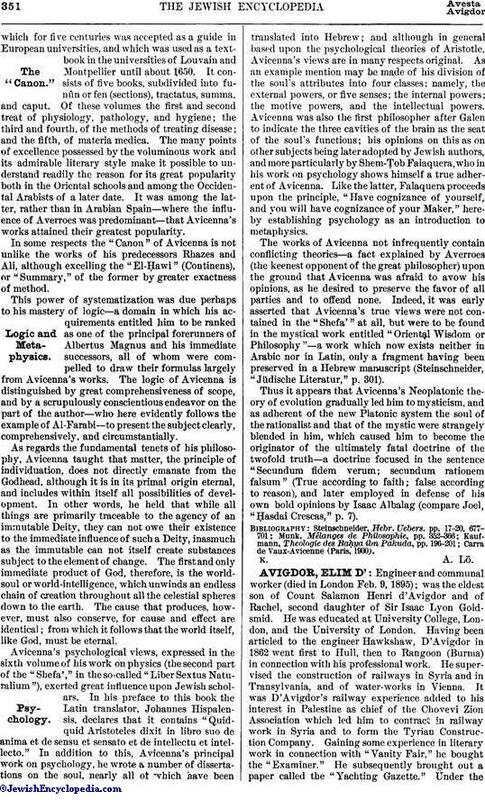 In addition to this, Avicenna's principal work on psychology, he wrote a number of dissertations on the soul, nearly all of which have been translated into Hebrew; and although in general based upon the psychological theories of Aristotle, Avicenna's views are in many respects original. As an example mention may be made of his division of the soul's attributes into four classes; namely, the external powers, or five senses; the internal powers; the motive powers, and the intellectual powers. Avicenna was also the first philosopher after Galen to indicate the three cavities of the brain as the seat of the soul's functions; his opinions on this as on other subjects being later adopted by Jewish authors, and more particularly by Shem-Ṭob Falaquera, who in his work on psychology shows himself a true adherent of Avicenna. Like the latter, Falaquera proceeds upon the principle, "Have cognizance of yourself, and you will have cognizance of your Maker," hereby establishing psychology as an introduction to metaphysics. The works of Avicenna not infrequently contain conflicting theories—a fact explained by Averroes (the keenest opponent of the great philosopher) upon the ground that Avicenna was afraid to avow his opinions, as he desired to preserve the favor of all parties and to offend none. 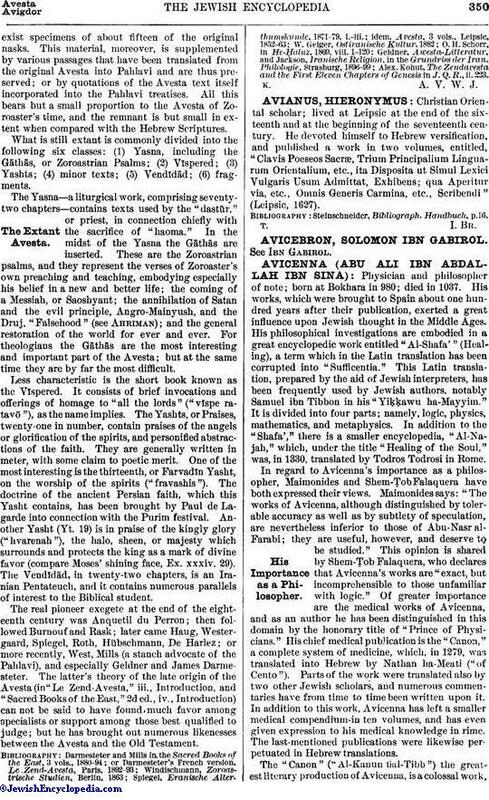 Indeed, it was early asserted that Avicenna's true views were not contained in the "Shefa'" at all, but were to be found in the mystical work entitled "Oriental Wisdom or Philosophy"—a work which now exists neither in Arabic nor in Latin, only a fragment having been preserved in a Hebrew manuscript (Steinschneider, "Jüdische Literatur," p. 301). Thus it appears that Avicenna's Neoplatonic theory of evolution gradually led him to mysticism, and as adherent of the new Platonic system the soul of the rationalist and that of the mystic were strangely blended in him, which caused him to become the originator of the ultimately fatal doctrine of the twofold truth—a doctrine focused in the sentence "Secundum fidem verum; secundum rationem falsum" (True according to faith; false according to reason), and later employed in defense of his own bold opinions by Isaac Albalag (compare Joel, "Ḥasdai Crescas," p. 7). Carra de Vaux-Avicenne (Paris, 1900).